Mix all ingredients together. Pack into well greased 11″ ring mold or casserole. Bake at 350° for 30 minutes. 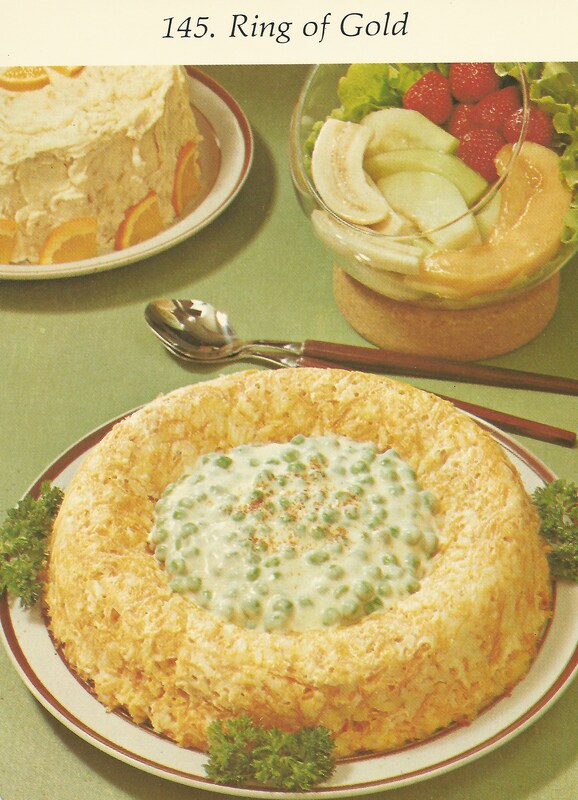 Serve with creamed peas. Makes 6 servings. Early in the day prepare or buy orange cake. 5:00pm Prepare Ring of Gold. It should be in the oven by 5:20. 5:30 Arrange fresh fruit salad. Prepare creamed peas. 5:55 Turn Ring of Gold out on serving plate. 6:00 Bon appetit! Enjoy your dinner. After dinner serve orange cake.